The ECO2N (TOUGH2 and TOUGHREACT) and ECO2M (TOUGH2) simulators supported by PetraSim are widely used to simulate subsurface CO2 sequestration in saline aquifers by modeling physical, residual , solubility and mineral trapping of injected CO2 in sub and super-critical conditions. Use PetraSim to create radial or three dimensional TOUGH2 meshes representing cap rocks and reservoirs with heterogeneous properties. 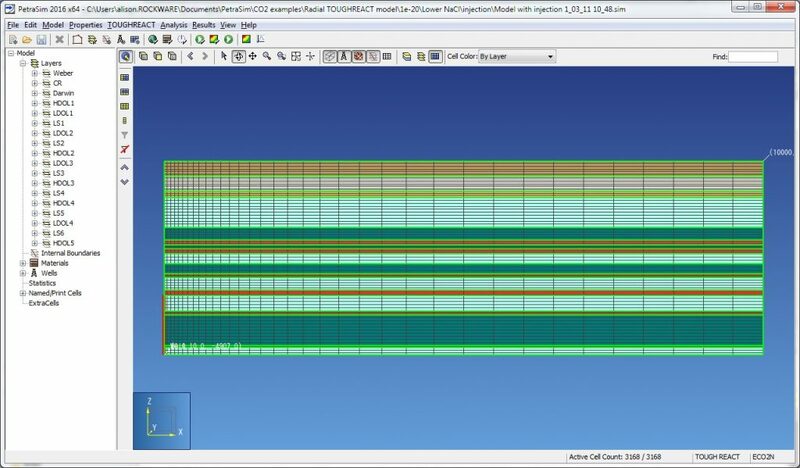 Import conceptual model layers using xyz ASCII file or using GRDECL files exported from Petrel or other modeling packages. Assign material properties to each conceptual model layer, or assign cell-based Permeability and Porosity values to represent heterogeneous materials. Create vertical or deviated injection wells using the interface or by importing an ASCII file containing data for multiple wells. Graphically display changed in gas saturation and dissolved CO2 over time. Use TOUGHREACT and PetraSim to model and visualization water-rock reactions, including changes in porosity caused by CO2 injection. Brantley, Duke; Shafer, John; Lakshmi, Venkat (2015). CO2 injection simulation into the South Georgia Rift Basin for geologic storage: A preliminary assessment, Environmental Geosciences, V. 22, No. 1, 1 – 18. Bruno, Michael S.; Laoa, Kang; Diessl, Julia; Childers, Bill; Xiang, Jing; White, Nicky; van der Veera, Ellen (2013). Development of improved caprock integrity analysis and risk assessment techniques, Energy Procedia (2013). Brydie, J. R.; Perkins, E. H; Fisher, D; Girard, M; Valencia, M; Olson, M; Rattray, T (2014). The Development of a Leak Remediation Technology for Potential Non-Wellbore Related Leaks from CO2 Storage Sites, Energy Procedia 63, 4601 – 4611. Dalkhaa, Chantsalmaa; Okandan, Ender (2013). 2-D numerical modeling of CO2-water-caprock interactions at a potential CO2 storage site in Turkey, Geochemical Journal, Vol. 47, 499 – 511. Hermanson, J.; Kirste, D. (2013). Representation of geological heterogeneities and their effects on mineral trapping during CO2 storage using numerical modeling, Procedia Earth and Planetary Science 7 ( 2013 ) 350 – 353. Hortlea, Allison; Michael ,Karsten; Azizia, Ehsan (2014). Assessment of CO2 storage capacity and injectivity in saline aquifers – comparison of results from numerical flow simulations, analytical and generic models, Energy Procedia 63 ( 2014 ) 3553 – 3562. Huber, Erik J; Stroock, Abraham D.; Koch, Donald L. (2016). Analysis of a time dependent injection strategy to accelerate the residual trapping of sequestered CO2 in the geologic subsurface, International Journal of Greenhouse Gas Control 44, 185-198. Konishia, Chisato; Ohokaa, Masao; Ikedaa, Seiichi; Itoc, Makoto; Takagid, Masato (2014). The Impact of Including Heterogeneity into the Simulation Model for the Evaluation of CO2 Injectivity and Sequestration, Energy Procedia 63 ( 2014 ) 3070 – 3077. 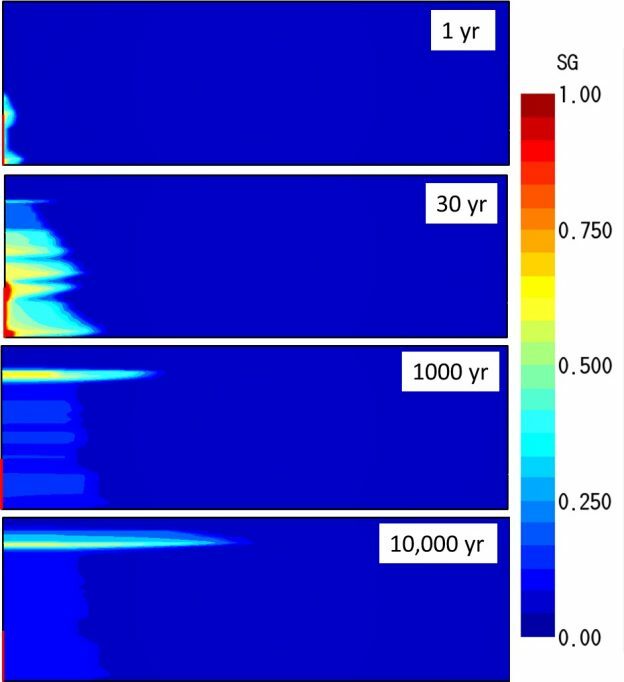 Krevor, S. C. M., R. Pini, B. Li, and S. M. Benson (2011), Capillary heterogeneity trapping of CO2 in a sandstone rock at reservoir conditions, Geophys. Res. Lett., 38, L15401, doi:10.1029/2011GL048239. Michaela, Karsten; Varmaa, Sunil; Bekeleb,Elise; Campic, Monica; O’Brien, Geoff (2013). Basin-scale Impacts of Industrial-scale CO2 Injection on Petroleum and Groundwater Resources in the Gippsland Basin, Australia, Energy Procedia 37 ( 2013 ) 2570 – 2578. Plaksina, Tatyana; White, Christopher; Nunn, Jeffrey; Gray, Taylor (2011). Effects of Couples Convections and CO2 Injection in Stimulation of Geopressured Geothermal Reservoirs, PROCEEDINGS, Thirty-Sixth Workshop on Geothermal Reservoir Engineering, Stanford University, Stanford, California, SGP-TR-191. Strandlia, Christin W.; Benson, Sally M. (2013). Diagnostics for Reservoir Structure and CO2 Plume Migration from Multilevel Pressure Measurements, Energy Procedia 37 4291 – 4301. Suchodolska, Katarzyna; Labus, Krzysztof (2016). Simplified Models for Reactive Transport and Chemical Reactions During CO2 Storage in Saline Aquifers, Energy Procedia 97 ( 2016 ) 509 – 514. This entry was posted on June 21, 2017 by Alison Alcott.